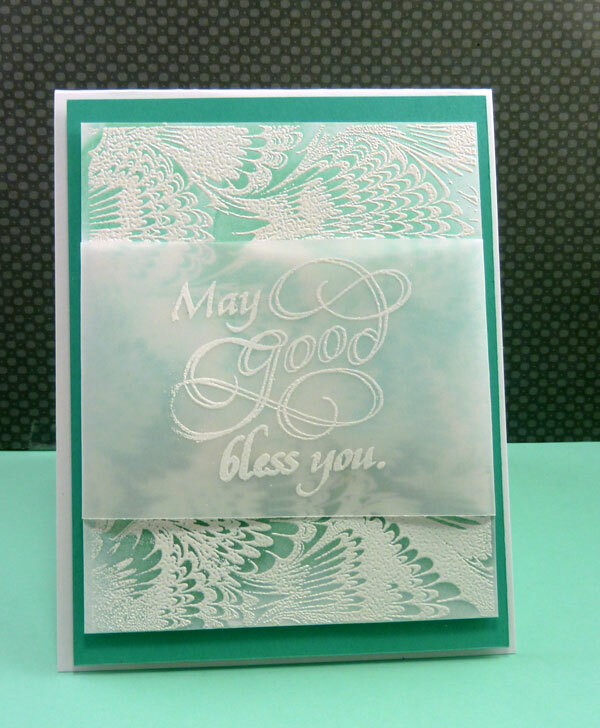 My first card uses this month's Stamp of the Month... Marble Feathers Background. 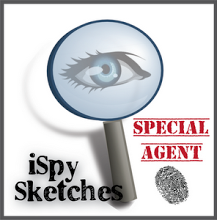 I stamped the image with versamark and heat embossed with white. Next I sponged the background in aquas- darker on the bottom and going light towards the top. Since I didn't want to totally cover up the background, I stamped the May Good Bless You sentiment (isn't that a wonderful sentiment!!) on vellum with versamark and heat embossed it in white as well. Sorry the pic isn't the greatest- I tried a lot!! Now, we have a little Irish in the family so I couldn't let the month go without doing a St. Patty's Day card. I die cut the Shamrock die several times in white (leaving the pieces in the die) and adhered randomly onto a white panel. I stamped the Happy St. Patty's Day sentiment onto an oval die and stitched die with Cheery Lynn dies (Serendipity sells these in the store) and adhered with foam dots for dimension. Layered on some patterned paper and added a crinkly seam binding bow to finish it off. Both cards are very lovely!! 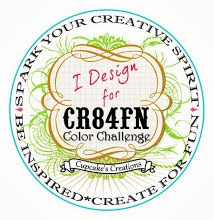 There is a lovely ethereal quality to the first card from the background stamp and color choices. Love it! I really like how you put together the multiple shamrock diecuts on the second. Great cards! Love the shamrock technique and all of the green on both cards. Sweet and simple! 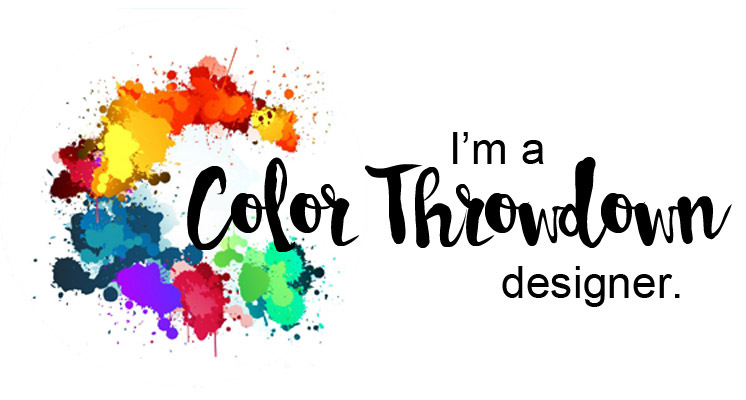 Love both your pretty cards! 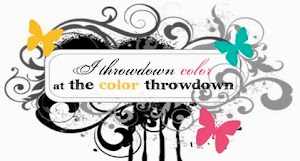 Wonderful background on the first, and what a great sentiment! Love the popped up shamrocks on the second! Thanks for sharing. Great cards. I like the backgrounds on both. Beautiful cards! 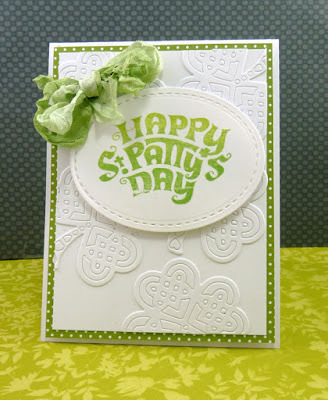 I love the gorgeous background stamp you used on your first card, and the pretty shamrocks on the second one! All of your cards are adorable but I am bonkers over the white shamrocks! What a creative idea! LOVE it! The marble background is very interesting, give the card just the right amount of zip, without being crazy like it very much. The second card I love being Irish myself I was drawn to it right away, sweet card. Such a soft background and love the vellum band! It was love at first sight when I saw the marbled background stamp. To top it off, the shamrock die is a perfect touch to the St. Patrick's Day card. It's really striking with all the pieces left in place to add some dimension to the white background. Very nice, indeed.